The Lazar focus I once had surrounding bike racing has come to an end. No long or complicated story behind why; it comes down to a mix of desire and priorities have shifted to other things. Tour of Hermann Gravel Race and Dogfish CX in Hermann are still a go, no changes there. What will change is how much and the type of racing I do. I'm working to simplify my cycling hobby by getting rid of the majority of my equipment (down to one bike) and no longer tracking stats or watts or blogging about races; just riding to stay fit with a race here and there. I've been lucky over the past few years in that each year is better than the last. One of these days it will start to go the other way as age gets in the way, but for now it's all roses and sunshine. After the Big Rest is time for the Big Tests. Today was a 5 min test. 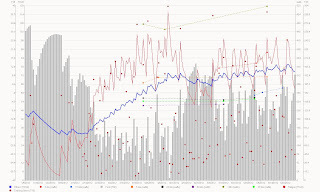 I like looking at a season long mean maximum graph set up to show best watts per Kilogram. The dotted line is this year, solid yellow last year. It’s a great way gauge progress as it relates to getting better or not. Today the 5 min test showed I'm in a good spot. Better than where I was last year at this time. 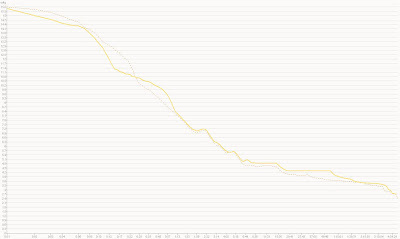 My 5 min W/KG is the exact same as last year but last year I hit that number in October. Next up a threshold test. The big rest is now over. 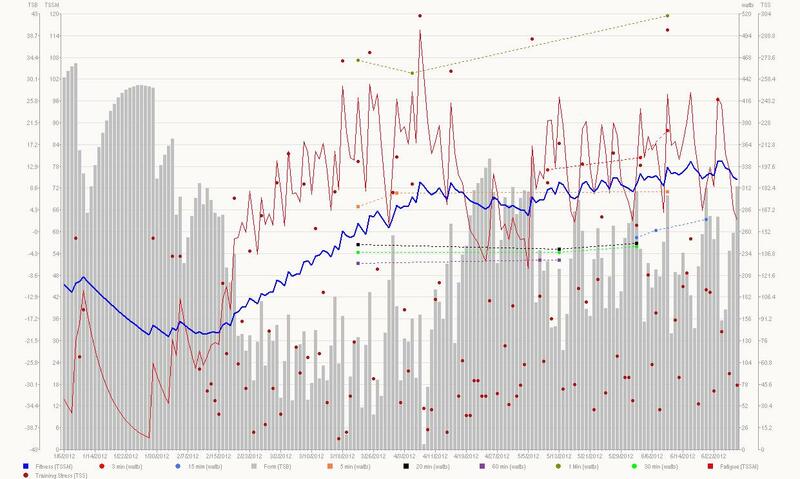 The big rest is one week each year after base and half way into threshold improvement where I set the bike aside for nearly a week enjoying the time off. It feels strange as always to take so much time off the bike but for me it works well. It's refreshing and I get caught up on some things around the house. 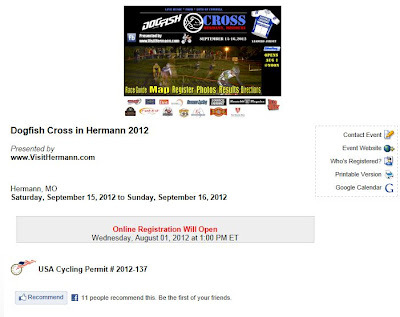 Next up is 8 more weeks of threshold improvment, then it's only two weeks after that before the first CX race. It's getting close. 73 days til cross starts! It's June, that means it's time for the MO State Road Race! 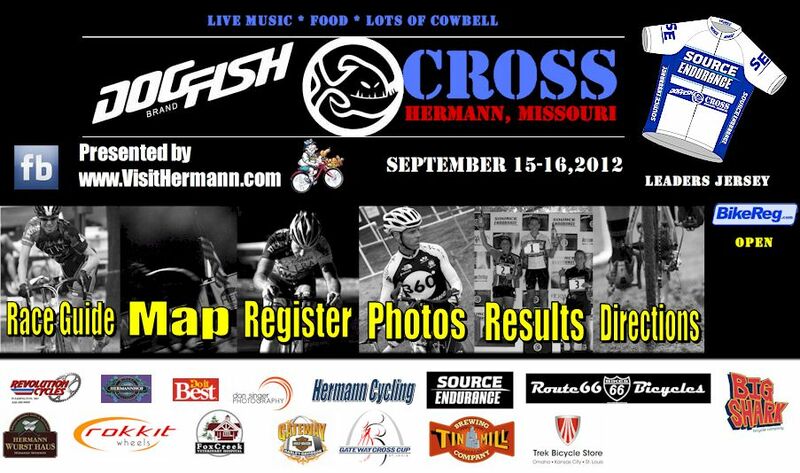 This race and last weekends Hellbender are a good tests to see how training is coming along as cross quickly approaches. Beofre the race Dawndi and I had a great time in the shops down south, even picked up a new bike. When we arrived on race day I was lucky enough to be part of a documentary http://www.wsiu.org/ was doing about the race. They were all over the place with cameras before, during and after the race. Before we started I did an interview, should be fun to see how they edit and put this together. The 40-44 jersesy was once again up for grabs as well as the KOM. Last year I won the KOM, 5th overall 40+ and 3rd for the 40-44 state title. This year it was hard to tell what was going to happen. Local Hermannite Jose has been climbing great out here in the hills of Hermann, I had a hutch he would take the KOM, and racing with the guys last weekend there were plenty of them in good shape. Last weekend I was up-set with my self for not being more aggresive when four riders slipped off the front, today that was not going to happen. After the head wind section there were a few attempts to break loose, the one I remember the most was Chris Hudson who spent a good portion of lap one off the front then the team of Gateway tried to counter. I did my best to close the gaps without burning to much energy. In the end things were almost back together as we approached the KOM in lap 1. Trent Donat, Tracy Smith and I think Andy Hunsaker were off the front a bit at the base. Jose and I set a good pace up the hill passing Tracy and Andy trying to bring back Trent before the top. No dice, Trent had a large enough gape coupled with good climbing legs, he crested the top 1st, Jose 2nd with me in 3rd. Jose and I started to do the math for the KOM. Trent had 3 points, Jose 2 and I had 1. For Jose to win we needed him to take first for 3 more points, total of 5 and I had to make sure I beat Trent giving him 1 point. That would give Jose the KOM win and I would get 3rd. If we did that Jose and I made a deal to split 1st and 3rd prize money. It was set, now we just had to make it happen. With the KOM approaching for the final time Trent, Jose and I were at the front waiting for the fire works to starts. Trent took the lead pacing up the hill. Things are going well as we hit 300m to go, but then Jose yells out to me he is cramping, Trent and I go off alone. I surge going by Trent only to have him match it and pass me for the win. Trent took 1st in the overall KOM with 6 points, me 2nd with 4 points and Jose despite his cramps and zero points in lap two had enough points in lap 1 with 2 points to take 3rd. That was a good battle and tons of fun. With that fun over it was time to see who was left at the top for the trip home back to town for the finish sprint. State championships are earned in 5 year age brackets, 40-44 and 45-49, MO residents only. Quick scan of the filed from those left for the 40-44 State Champions were Alan, Trent and I. Most of the group was 45-49 so they took over the pace with two miles to go. We made it through the tricky left hander that caused a wreck last year then off to the finish line. I did my best to hang in there but ran out of gears for that tailwind finish, only down side to racing my single chain ring cross bike, Allen pimped Trent at the line for the state championship, Rob with his monster sprinting took the overall win and Andy brought home the 45-49 State title. I was happy to reach the 40-44 podium and 5th overall. Now in my 2nd year raceing 40+ it's been great racing with this group of guys. I respect their abilities and their respect for proper gamesmanship.